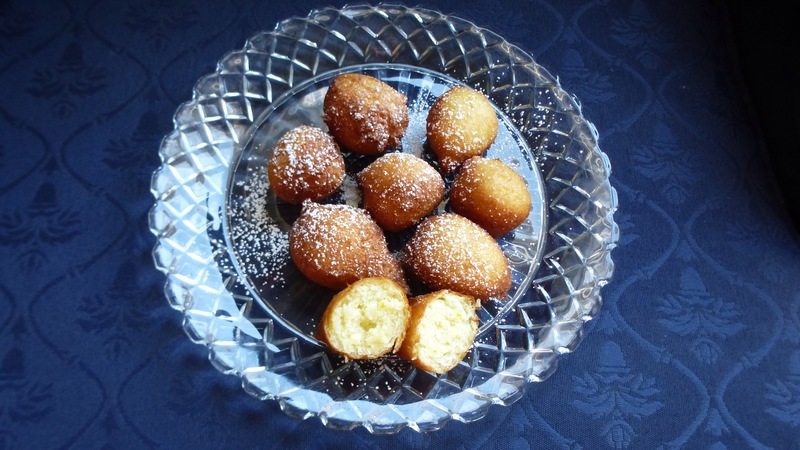 Sfingi are ricotta fritters typically served in Italy and Sicily for St. Joseph’s Day on March 19th. They are sometimes called zeppole. I have several family recipes for them, but the one I like best is adapted from my aunt Marge. I like to use Trader Joe’s whole milk ricotta for this recipe because it is creamy, moist and light. I find it is best to fry the fritters in two inches of hot oil on medium low heat. If the oil is too hot, the fritters get very dark on the outside but are still raw on the inside. You want them golden with a light cake-like interior. I also turn them just once so they don’t absorb too much oil. 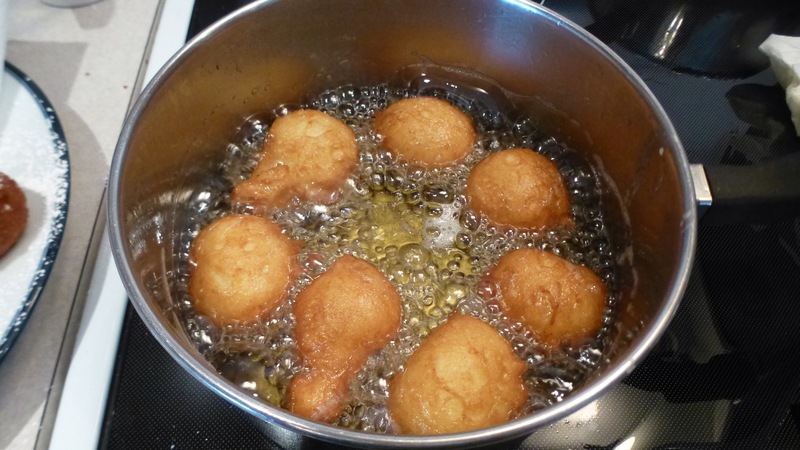 Actually, if the batter is the right consistency the fritters turn over by themselves in the hot oil. They are light and delicious. Begin by pouring enough canola oil in 2-quart saucepan so that it is roughly two inches deep for frying the sfingi. Turn the heat to medium low. While the oil is heating, in a medium bowl whisk together ricotta and granulated sugar. Add eggs and beat until smooth. Add orange and lemon zest. Mix. Add vanilla and mix again. In a separate bowl sift together flour, baking powder and salt. Whisk flour into the ricotta mixture and beat until smooth. Test to see if the oil is hot enough by spooning just a little batter into the oil. If it is hot enough the batter will quickly rise to the surface and begin to turn golden. Spoon about 1 tablespoon of batter into the hot oil. You can fry 6-7 sfingi at a time. The sfingi will float to the top and begin to turn golden. At this point they may turn over on their own. If not, turn the sfingi. Cook until golden on both sides. It should take 2-3 minutes. Don’t keep turning the sfingi. Only turn once to keep them from getting greasy. Remove sfingi with a slotted spoon onto a paper towel-lined plate. Let cool for 2 minutes then sprinkle them with confectioners sugar. Serve warm. Makes 40 sfingi. This entry was posted in Breakfast, Cakes, Christmas, Desserts, Easter. Bookmark the permalink.